Having access to the right equipment is essential for any cook, cake baker or cake decorator, whether you are just starting out in cake making and decorating or an experienced cake designer . And no one understands that better than Sugarbliss Cake & Craft Company. In our cake supplies and sugar craft shop we have put together a extensive range of cake craft equipment and cake decoration tools that will not only make your baking easier but also make your cakes more professional and successful too. Our carefully chosen selection of market-leading cake equipment will help you master the art of cake, cupcake and cookie decorating. From general household items such as boards, palette knives and rolling pins to more specific tools such as, moulds, cutters, veiners and modeling tools. At Sugarbliss Cake & Craft Company we have all the tools and advice you will need for your cake design and cake making requirements. This week has been busy with an assortment of exciting new products arriving, so keep an eye out for them in our Cake Craft Supplies Shop! We have just added a fantastic selection of Cake Mixes to our cake ingredients range, and anybody thinking of baking cakes or cup cakes for the jubilee or any celebration will appreciate how easy and delicious our cake mixes are. Our sweet range of cake mixes include-Vanilla, Death by Chocolate and NEW Red Velvet, Carrot, Egg Free Vanilla and Gluten Free Vanilla! Although at Sugarbliss Cake & Craft Company we bake our own cake recipes, not everyone has the time or inclination! After many customer requests, we now offer easy to use cake mixes for those who enjoy home baking but need the reassurance of consistent results every time. You have the flexibility to bake whatever shapes and sizes of sponge you need – big cakes, little cakes, novelty shapes and cupcakes! The new vanilla or death by chocolate sponge cake mixes, packed in 3kg boxes, are extremely versatile and tolerant to a wide range of baking conditions. The mixes will produce a close textured moist cake, firm and easy to handle, which should keep well for at least 2 weeks. 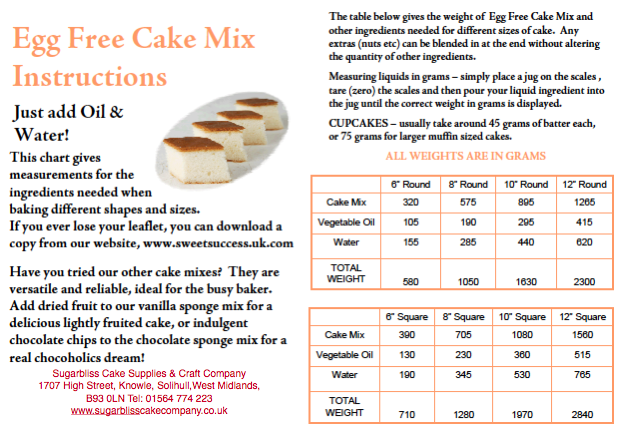 The results will not be identical to our own baked bases, as these are baked from scratch ingredients and cannot be recreated exactly in a cake mix, However, cakes baked by using these mixes will be just as suitable for decorating and tasty. You also have the advantage of being able to add extra ingredients and flavours – fruit, chocolate chips, lemon flavouring? 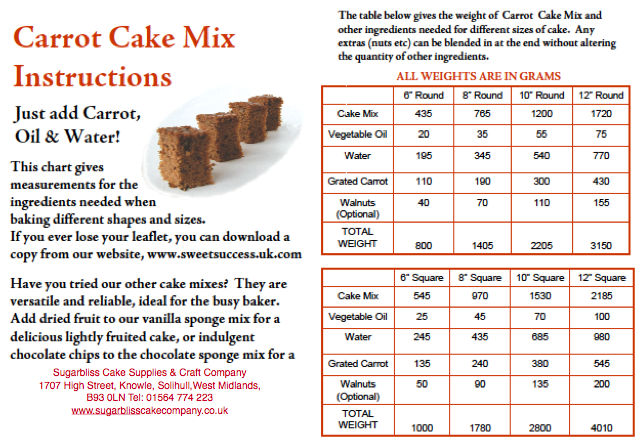 A three kilogram box will be plenty to make three large 10″ square cakes, or six 8″ round cakes. You can also get between 130 and 200 cupcakes from one box, depending on the size of your cupcakes! 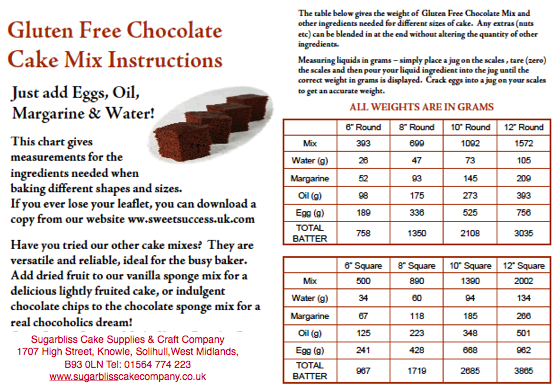 A full instruction leaflet showing quantities of the vanila or chocolate cake mix needed for different sizes and shapes of cake is enclosed in the packaging. 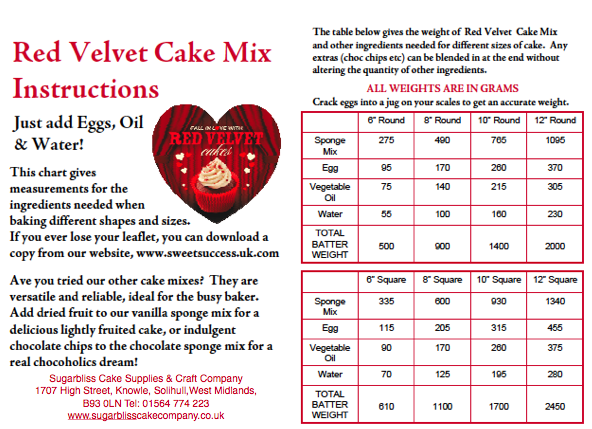 We also have Red Velvet, Carrot, and Egg Free sponge cake mixes, all available in 1.5kg bags. With a subtle chocolate flavour, moist texture and striking colour, Red Velvet is the lastest cake craze from America to hit the UK. The cake are absolutely gorgeous, baked as cupcakes with a vanilla frosting. A 1.5kg pack of Red Velvet Cake Mix is plenty for three 8″ round cakes, or 60-90 cupcakes depending on size. Instructions are included for an 8″ round cake. I have just finished completing a wedding cake design for later on this year and I am really excited with this cake design, as I will be using some colourful feathers with diamantes to finish the wedding cake decorations. 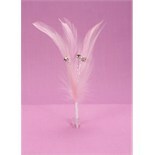 In our sugar craft shop we have a lovely range of feathers in some fantastic colours. Some of the feathers have diamantes included which look wonderful sparkling under the lights and complement the other diamante decorations perfectly.This wedding cake is truely going to be a real eye catcher! I will post some pictures when the wedding cake has been completed. 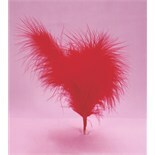 Sugar Sheets!-These sugar paste sheets are printed with edible food colours and measure 300mm x 300mm. Metal cutters can be used to cut shapes from the flexible sugar sheets, giving you an exciting new way to decorate cupcakes, cookies and cakes. I have just finished a fabulous birthday cake and some cupcakes using the new sugar sheets that have recently arrived in our cake craft shop. 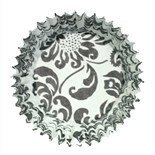 There are several designs to choose from, but the one i have just used is the black rose design on a white background. 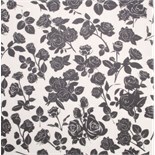 The black rose pattern sugar sheet also has matching cupcake wrappers which looked absolutely stunning displayed on our 3 tier cupcake stand. Sugar sheets are a great idea and really easy to use. 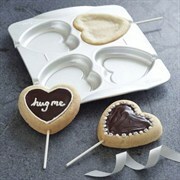 The sugar sheets almost create an instant cake decoration! You can, as i just have, use the sheets in strips around a cake, or to cut out shapes using scissors, cutters or a modeling knife. All you have to do to use the sugar sheets is to peel off the backing sheet and fix your shapes onto the cake with edible glue. They really are a great alternative way to decorate a cake. 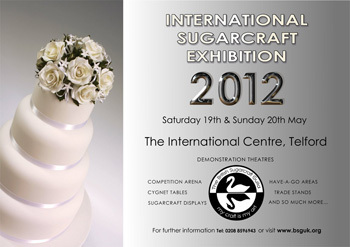 Although we are very busy this weekend in our sugar craft shop and with cake orders, we are going to find as much time as possible to spend at the 7th British Sugarcraft Guild Show at Telford Exhibition Centre. It’s so exciting to be able to visit and we are really looking forward to gaining inspiration from the various stands and the competition arena. The Exhibition is on all weekend (19th & 20th May)-Hope to see some of you there. How Much Ribbon To Go Round A Cake/Board? At our Sugarbliss Cake Craft & Cake Decorating Shop we have a beautiful range of decorative cake ribbons, frills and trims which will add the finishing touch to your perfect special occasion cake. 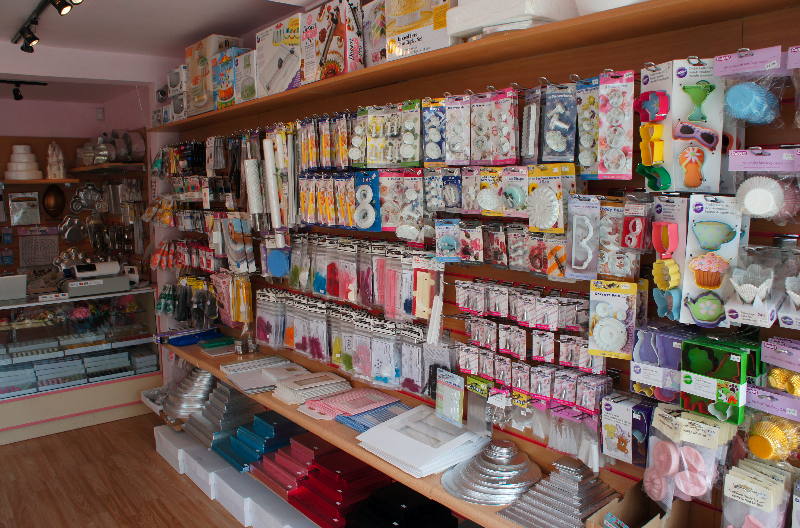 Whether it’s for a birthday, christening, wedding or Christmas, in our craft shop we are sure you will be able to find the ideal ribbon for your cake. One of the most common questions we are asked here at Sugarbliss Cake Craft is – How much ribbon do I need to go around my cake or cake board? 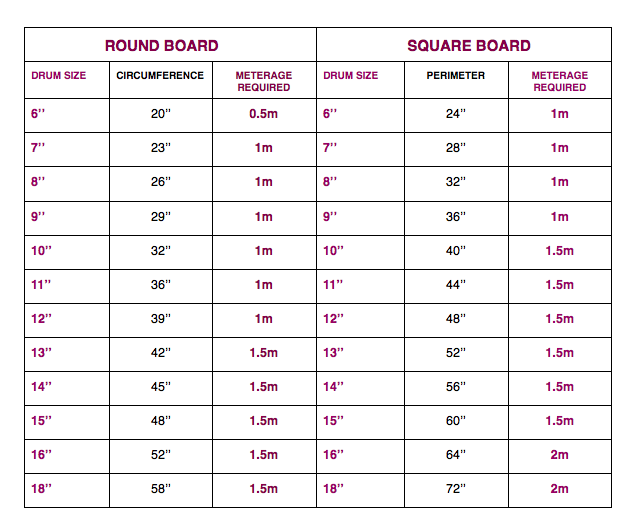 To answer this question we have made a simple guidance table which we really hope will help. Once you have chosen your ribbon and have cut to the correct size, to ensure the ribbon will be completely level when attaching to the board or cake edge, place onto a smooth level surface and attach the ribbon to the board edge using a glue stick, or to the cake edge by dabbing a small amount of piped icing to the ribbon at the back of the cake. Sugarbliss Cake Craft & Cake Decorating. 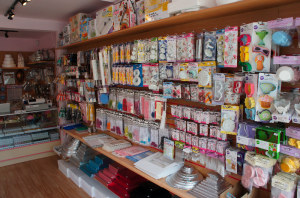 Our Sugarcraft & Cake Decorating shop is a one-stop shop offering a complete range of cake decorating supplies including tools, icing, cutters, food colours, boxes, ribbons, moulds and cake decorations. In fact, everything for the cake decorator from beginner to professional to make their very own delicious cakes every time and at great prices. 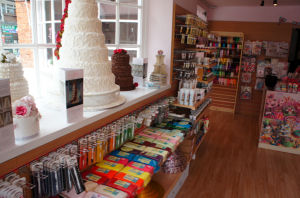 Our new online sugarcraft shop will be available for you to purchase all your cake decorating supplies from 1st July 2012 and our call and collect service, saving you time and money is available Now. Simple call us on 01564 774 223 and we will have all your items ready for you to collect from our shop in Knowle. 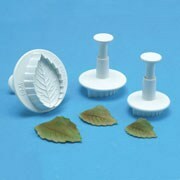 In our shop you can also hire cake making equipment such as cake tins, cutters etc. 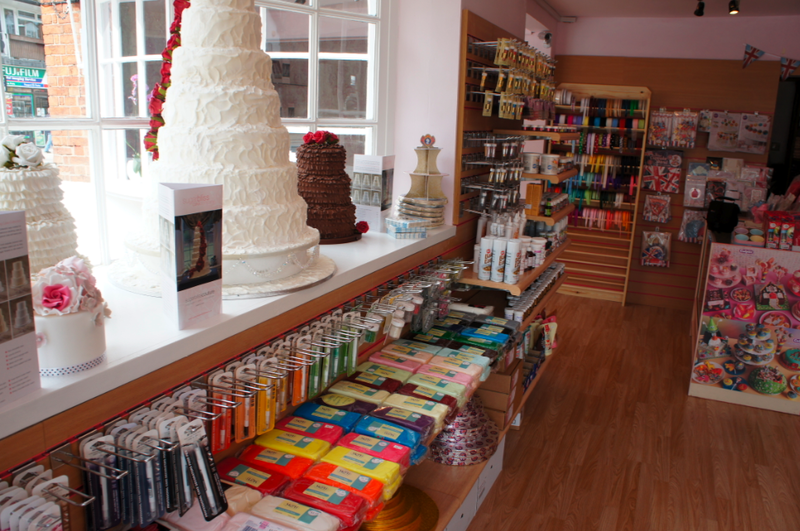 and get expert advice from our experienced Sugarbliss team of cake designers. You can book onto our very popular cake classes (classes for July, August and September dates now available) and order cakes for your special occasion by browsing through and choosing cake designs from our extensive weddings, birthday and celebration cake portfolios, or have us create something personal and completely different to make your cake just perfect for your special celebration. Our Sugarbliss Cake School & Cake School For Kids, caters for all ages where you can learn cake making craft skills. The popular cake classes run throughout the month for beginners & children who want to learn the basic skills of cake decoration, to advanced classes for those who want to enhance and learn new skills in cake decoration. At Sugarbliss they have classes which cater for all skill levels that will enhance and inspire you. Learn how to ice the perfect cake, securely stack and assemble tiers and pipe exquisite spring flowers, or you may prefer to take an evening class or a fun one day ‘Couture Cookies’ class with friends or colleagues and create their own chic collection of iced cookie treats to take home. For cake schedules & information please contact us. We are also the perfect solution for those seeking sweet satisfaction by creating truly stunning cake designs that can accommodate all tastes and desires. From elegant and chic party cakes to the traditional tiered wedding cake, we can supply exactly what you want without compromise, especially when it comes to your wedding day. You can also sample some of our award winning cake recipes by ordering one of our delicious sample boxes. We also specialise in Eggless, Gluten Free, Vegan and Alcohol Free Cakes. If you are unable to find the product you are looking for, why not give us a call on 01564 774 223 or contact us where our knowledgeable staff are always happy to help. Alternatively, why not make a visit to our sugarcraft shop in Knowle, Solihull situated next to Knowle Church. The beautiful village of Knowle has many other arts and crafts shops, lovely restaurants and pavement cafes. OPENING TIMES: Monday 9.30am-5.30pm, Tuesday 9.30am-5.30pm, Wednesday 9-6pm, Thursday 9-6pm, Friday 9am-5pm & Saturday 9am-5pm.